Two articles published in the journal “Monthly Notices of the Royal Astronomical Society” describe two researches on comet 67P/Churyumov-Gerasimenko based on data collected by ESA’s Rosetta space probe. In an article, a team led by Jürgen Blum of the Technische Universität Braunschweig, Germany, used the data collected to find out how the comet formed. 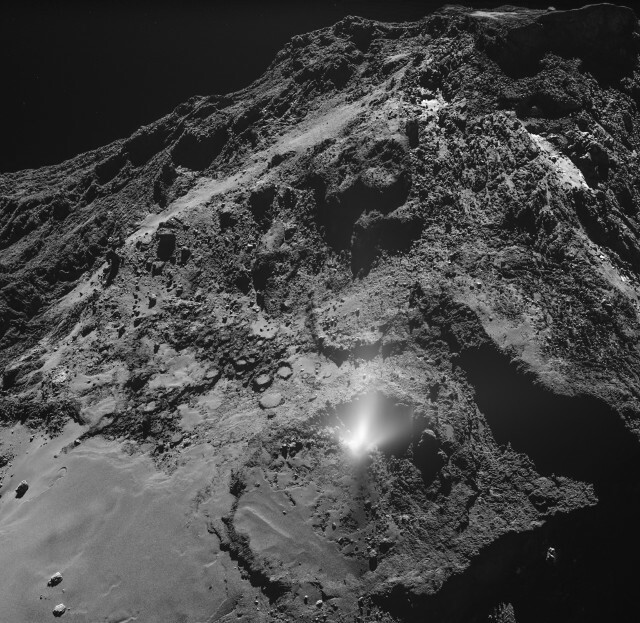 In the other article, a team led by Jessica Agarwal of the Max Planck Institute for Solar System Research in Göttingen, Germany, described a plume on the surface of the comet that could have been generated by pressurized underground gas or by the crystallization of amorphous water ice. The Rosetta space probe completed its study of comet 67P/Churyumov-Gerasimenko on September 30, 2016 with its impact on its surface but many scientists keep on examining the wealth of data collected. Research concerns a variety of types and range from those related to the comet’s origin to those focused on some specific characteristics or about what happened during the Rosetta mission. The team led by Jürgen Blum analyzed data collected by various instruments of the Rosetta space probe concluding that comet 67P/Churyumov-Gerasimenko probably formed following a collapse caused by the force of gravity of tiny dusty pebbles mixed with ice that slowly combined with an increasing compression. According to the researchers, among the various models proposed to explain the comet’s formation this is the only consistent with the collected data. The researchers analyzed the various characteristics of comet 67P/Churyumov-Gerasimenko and believe that only if it formed from tiny dust and ice particles they can be explained simultaneously. The characteristics are: global porosity, homogeneity, tensile strength, thermal inertia, vertical temperature profiles, sizes and porosities of emitted dust, and the steep increase in water-vapour production rate with decreasing distance from the Sun. Thanks to the low gravity of comet 67P/Churyumov-Gerasimenko the pebbles survived intact after its formation and for the Rosetta space probe it was possible to find them. 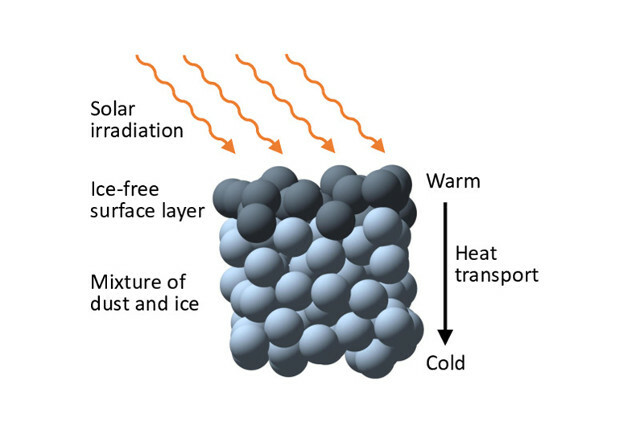 In the schematic representation at the bottom, the light blue spheres represent the mix of dust pebbles and ice particles with a top layer represented by the dark gray spheres that’s ice-free because exposed to direct sunlight. According to the researchers, this study has implications also on planetary formation models. The same process that led to the formation of comet 67P/Churyumov-Gerasimenko may have also led to the formation of larger objects. The dust pebbles were perhaps very strongly compressed by the instability of the nebula from which the solar system formed. If that’s the case, at the end the collapse happened that led to the birth of a larger object, including planets. The team led by Jessica Agarwal analyzed the data collected by the Rosetta space probe on a plume observed on July 3, 2016. At that point, comet 67P/Churyumov-Gerasimenko had been moving away from the Sun for some time, so it was almost 500 millions of kilometers from it. For about an hour a kind of fountain in the region called Imhotep emitted an estimated amount of dust around 18 kg per second with tiny grains of water ice. Other plumes and sudden variations in the territory were detected on the surface of comet 67P/Churyumov-Gerasimenko during the Rosetta mission but in this case the researchers were particularly lucky because the space probe was flying over that region. This means that five instruments detected what was happening and by chance Rosetta went through the plume providing a much larger amount of data than for other similar events. The energy of the plume indicates that there must be a source beneath the surface that can eject those materials. Despite all the studies already carried out, certain processes underway on comet 67P/Churyumov-Gerasimenko are still not well understood, so the data collected must keep on being examined. The researchers are also creating simulations to figure out what exactly was the source of energy that generated that and other similar plumes. The most likely hypotheses are the presence of a pressurized underground gas bubble and water ice that reacted violently to the direct exposure to sunlight.